3 Palms is one of the best value hotels amongst Scottsdale resorts. With deluxe guest rooms and extravagant suites, fine dining, a welcoming staff, and some of the best rates around, 3 Palms stands out in Scottsdale hospitality. 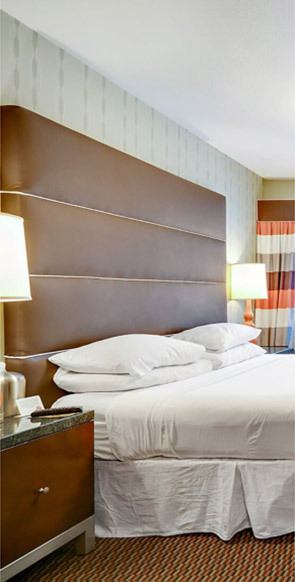 Accommodations are built to make all guests traveling for business or pleasure feel at home during their time in Scottsdale, making 3 Palms one of the most appealing hotels in Scottsdale for all types of travelers. When planning your trip, you'll be hard pressed to find a better deal than the top-notch amenities and incredible value of a 3 Palms stay. Our Deluxe King Suite offers sophistication with a contemporary style. The two large rooms are designed to instantly make you feel at ease. Each room contains its own lavish bathroom, sheathed in black granite and accented by the finest linens. The bedroom area is comprised of a luxurious, pillow top king bed, which is enhanced by 400 thread count sheets and an inviting down comforter. This guest room is equipped with a 42" flat screen tv and DVD/CD player to add to the comforts of home. The spacious living area contains a relaxing seating area made of a queen size sofa bed and comfy lounge chairs with a retro flare. Amenities such as an in room safe, blow dryer, iron and ironing board, microwave, refrigerator, coffee maker and many other conveniences will only enhance your stay in Scottsdale. A studio style hotel room with king size pillow top bed, 400 thread count sheets, and a down comforter. This room has contemporary furnishings accented with black granite walls and floor in the bathroom. Wireless internet access is available property wide with high speed dataports within the room. 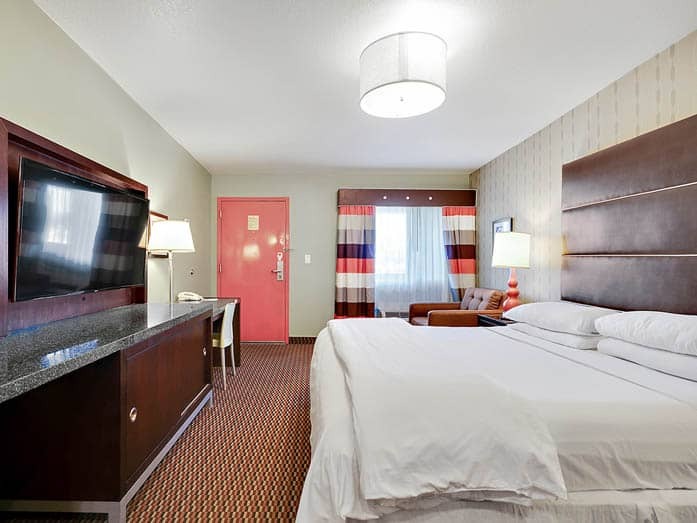 Each of our beautifully appointed guest rooms come complete with a 50 inch televison with premium cable channels, personal sized microwaves and refrigerators as well as a safe, blowdryer, phone, personal coffee maker, iron & ironing board.Deluxe King Rooms are 242 sqft. 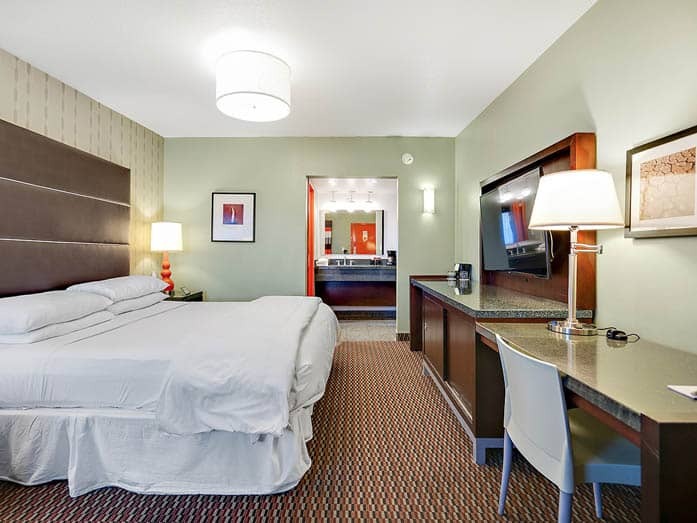 A studio style hotel room with king size pillow top bed and a multi jet whirlpool tub for two. In addition to the pillow top mattress this room contains 400 thread count sheets, and a down comforter. This room has contemporary furnishings accented with black granite walls and floor in the bathroom. Wireless internet access is available property wide with high speed dataports within the room. 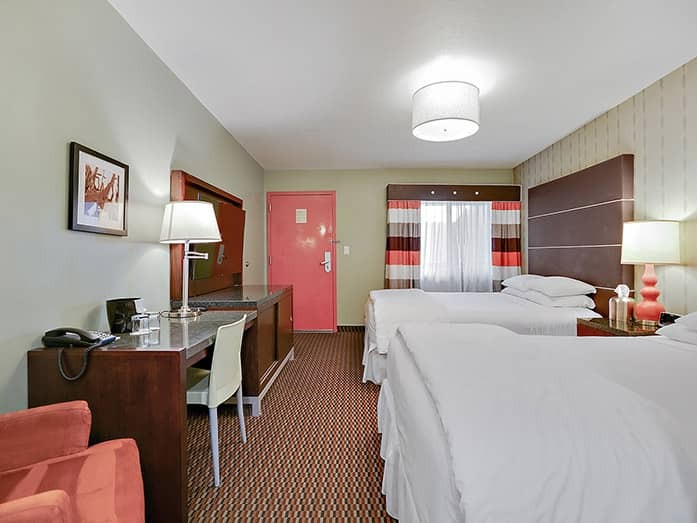 Each of our beautifully appointed guest rooms come complete with a 50 inch televison with premium cable channels, personal sized microwaves and refrigerators as well as a safe, blowdryer, phone, personal coffee maker, iron & ironing board. Deluxe King Whirlpool Rooms are 242 sqft. Our Deluxe Dual Queen Suite offers sophistication with a contemporary style. The two large rooms are designed to instantly make you feel at ease. Each room contains its own lavish bathroom, sheathed in black granite and accented by the finest linens. 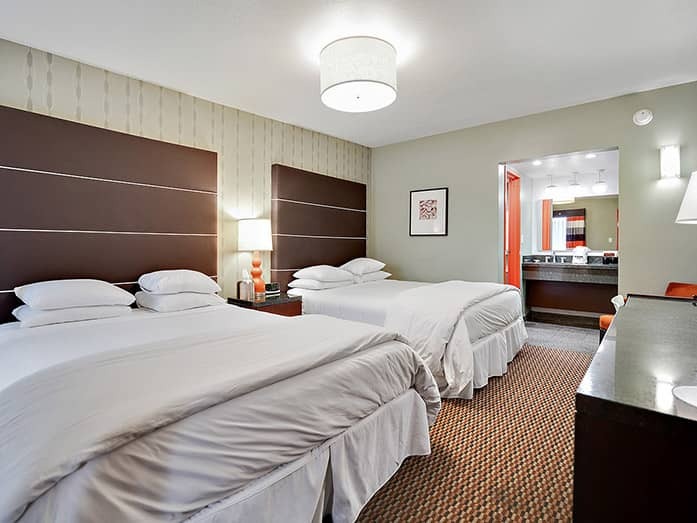 The bedroom area is comprised of two luxurious, pillow top queen beds, which is enhanced by 400 thread count sheets and an inviting down comforter. An entertainment center complete with a 42 inch flatscreen television, and DVD/CD player, add to the comforts of home. The spacious living area contains a relaxing seating area made of a queen size sofa bed and comfy lounge chairs with a retro flare. The dining table, and kitchen; which includes a microwave, refrigerator, stove, dishwasher, coffee maker, and fully stocked cook ware provide all the necessities from home. Amenities such as an in room safe, blow dryer, iron and ironing board, and many other conveniences will only optimize your experience in Scottsdale, Arizona. A studio style hotel room with 2 queen size pillow top bed, 400 thread count sheets, and a down comforter. This room has contemporary furnishings accented with black granite walls and floor in the bathroom. Wireless internet access is available property wide with high speed dataports within the room. 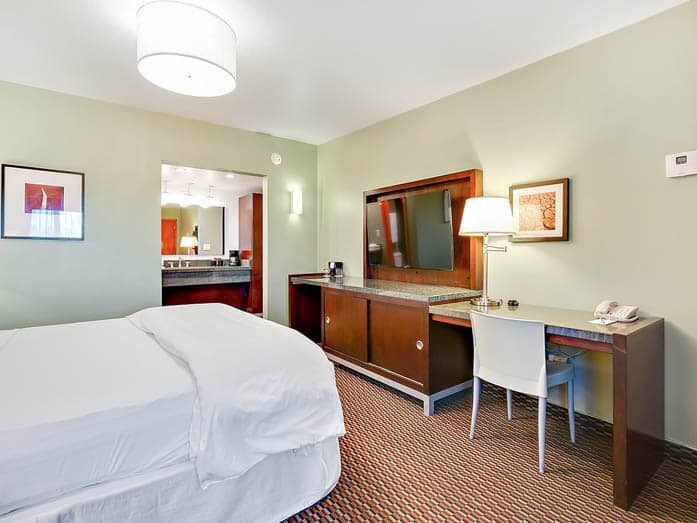 Each of our beautifully appointed guest rooms come complete with a 50 inch televison with premium cable channels, personal sized microwaves and refrigerators as well as a safe, blowdryer, phone, personal coffee maker, iron & ironing board. Deluxe Two Queen rooms are 242 sqft. 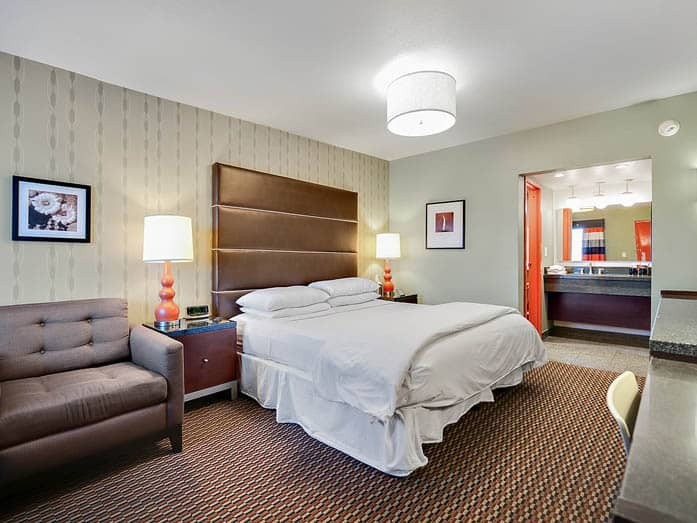 Of all the hotels in the wonderful desert oasis that is Scottsdale, 3 Palms is a top choice due to its upscale contemporary atmosphere, friendly staff, and great deals. This two-story adobe boutique hotel provides modern accommodations in the form of deluxe guest rooms and luxury one and two bedroom suites. Not only are the rooms and accommodations exceptional, but unlike many hotels in Scottsdale, 3 Palms features a dedicated business center, robust gym, laundry facilities, and free parking. Just two miles from downtown Scottsdale, 3 Palms not only resides in one of the most convenient locations in town, but the staff offers tour assistance, concierge, and a 24-hour front desk, so you can plan out your entire stay including recreational and leisure activities. El Dorado Park is located adjacent to 3 Palms, providing 60 acres of space to run and play sports, an amphitheater, and two lakes for additional recreation. Compared to other hotels in Scottsdale, it's tough to beat the incredible location of 3 Palms, considering all of the services offered on-site, as well as restaurants, museums, and tourist attractions nearby. 3 Palms is one of the best hotels in Scottsdale for both business and leisure travelers, due to it’s central location, and much more. All guest rooms and suites provide ultimate luxury in each aspect of your stay. Each room and suite provides large king or queen-sized beds dressed in fine 400 thread-count linens, four down pillows, a down duvet and a plush pillow-top mattress. Guests will not only sleep in luxury, but live in it as well. This is one of the only Scottsdale hotels that provides full length mirrors, complimentary newspapers, free high-speed wireless internet, and cordless dual line phones. Relax while watching a 50" flat screen television. Sink into luxury at one of the top-rated hotels in Scottsdale. 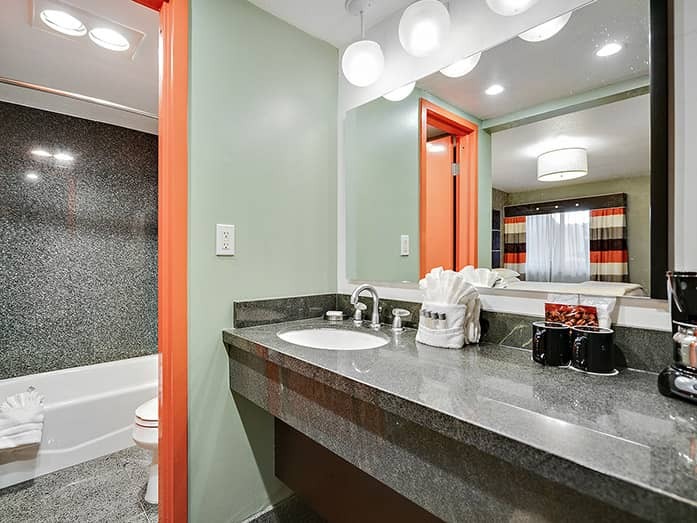 Deluxe spa rooms include whirlpool spa tubs built for two and 2 Queen suites provide full kitchens equipped with a stove, microwave, refrigerator, coffee maker with complimentary coffee and tea, cookware, and a dishwasher. Guests can enjoy a home-like experience during their stay at 3 Palms that is truly unlike any other Scottsdale Hotel. Whether you're seeking a hotel in Scottsdale for a business trip, family vacation, or leisurely group getaway, 3 Palms is one of the top hotels in Scottsdale with the best accommodations and greatest deals.